The file-syncing part of Adobe's new Creative Cloud family of technologies has been intermittently broken for a week, taking the "cloud" part out of Adobe's "Creative Cloud" redesign of its products. Now Adobe is suspending it "for the next couple of weeks" to make updates. 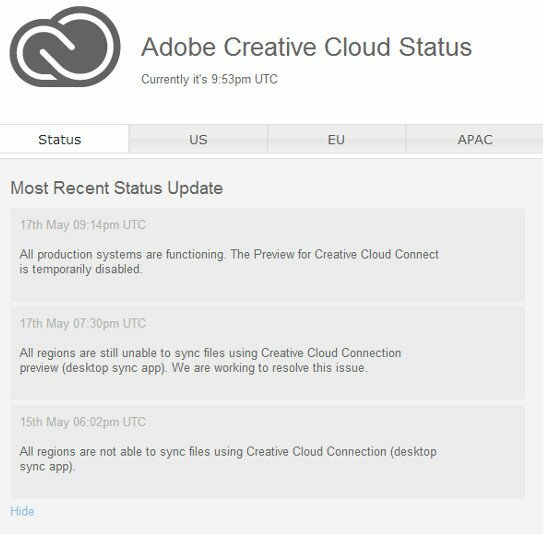 The sync feature, which means files being fiddled with on mobile devices such as tablets or in web browsers stay synced-up with desktops, has been out of action since May 15 at 6:02pm UTC, according to Adobe, but users have been reporting problems since Monday. This means that one of – in Adobe's own words – the "core pieces" of its Creative Cloud "vision" doesn't work. "With Connection, you'll be able to work where you want with the tools you've got at hand," Adobe crows. "Everything you create will seamlessly update across your devices." Adobe announced on Friday that it was suspending the file-sync desktop preview "for the next couple of weeks while we finalize the updates for the initial full release." Next month, we will launch the fully integrated version of our new Creative Cloud desktop application. As part of that transition, we are updating the server APIs and code that manages file sync. We had initially planned to take the preview offline next week for these updates, but some updates this week have caused instability in the service. We sincerely apologize for the inconvenience this may have caused you. The file-syncing service launched in preview in November 2012 as one of the first components of Adobe's rentier capitalism cloud revamp. The sync component will have an incredibly important role in the future, given Adobe's announcement at the start of May of its plans to axe its boxed Creative Suite software entirely and move everything to the cloud. "I just purchased Creative Cloud and I feel like half my 'toy' is broken! No fun at all!" one user wrote.